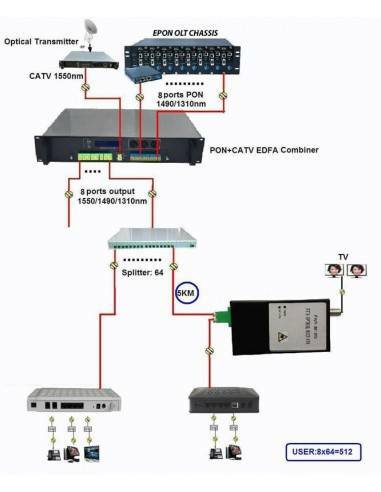 ICBAP-1550H-8x20 EDFA combiner is a newest PON+CATV FTTH/FTTP triple into one of optical transmitter system equipment, realized combine function of the amplification of optical signal OLT and CATV 1550nm. The optical input number: 1 port of CATV + 8ports PON input ports, 8 ports outputs of 1550nm/1490nm/1310nm combine output, the combined optical output power rate 20dBm. 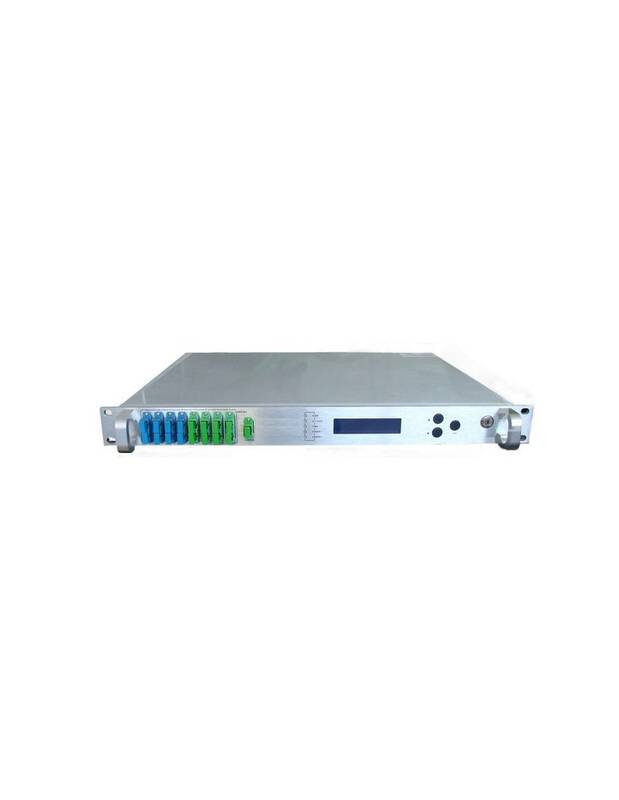 plug-in power supply, achieved the function of OLT and CATV 1550nm optical single combined and amplify, having high cost performance value. 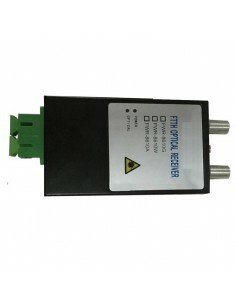 ICBAP-1550H-8x20 EDFA combiner is a representative one in the optical amplifier. 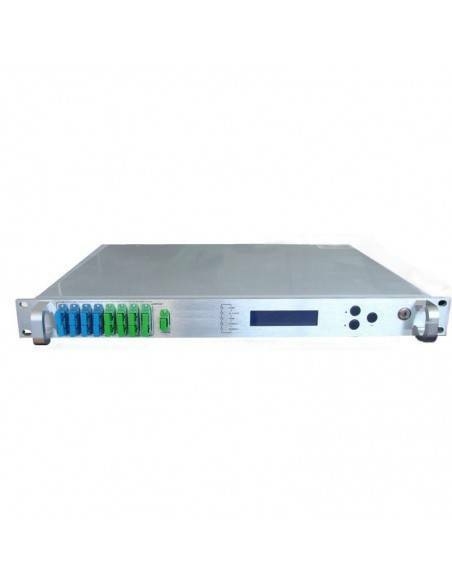 As the EDFA’s wavelength is 1550nm, it is in line with the low-loss band of fiber and its technology has been relatively mature, so widely used. Erbium-doped fiber is the core components of the EDFA, it makes quartz optical fiber as matrix material, and incorporate a certain proportion of rare earth element erbium ions (Er3 +) in the core of a fiber. When certain amount of pump light is injected into the erbium-doped fiber, Er3 + have been excited from the low-energy level to the high energy level, due to Er3 + has a very short lifespan on the high energy level, and soon transit to a higher level by the form of a non-radiative, and form the population inversion distribution between this energy level and low-energy-level. Because the energy between these two energy levels is exactly equal to the photon energy of 1550nm, stimulated emission of 1550nm light can only occur, we can only enlarge 1550nm optical signal. ICBAP-1550H-8x20 EDFA combiner adopt 980nm or 1480nm high linearity, optical isolation, the DFB, thermoelectric cooling DFB laser produced by JDSU, Fujitsu, Nortel, Lucent, Fitel and other world-renowned semiconductor companies as the pumping source. In the interior of the machine is equipped with the light power export stable circuit and laser Thermoelectric cooling device Temperature stability control circuit to ensure optimal machine performance and long-life laser stability. The microprocessor software monitors the lasers’ working state, the Digital Panel (VFD) displays the operating parameters. Once the laser operating parameters deviate from the permissible range set by the software, micro-processing will automatically turn off laser power, red light goes on to warn, digital panel prompts cause of troubles., a detailed report of the device parameters please read "instructions." 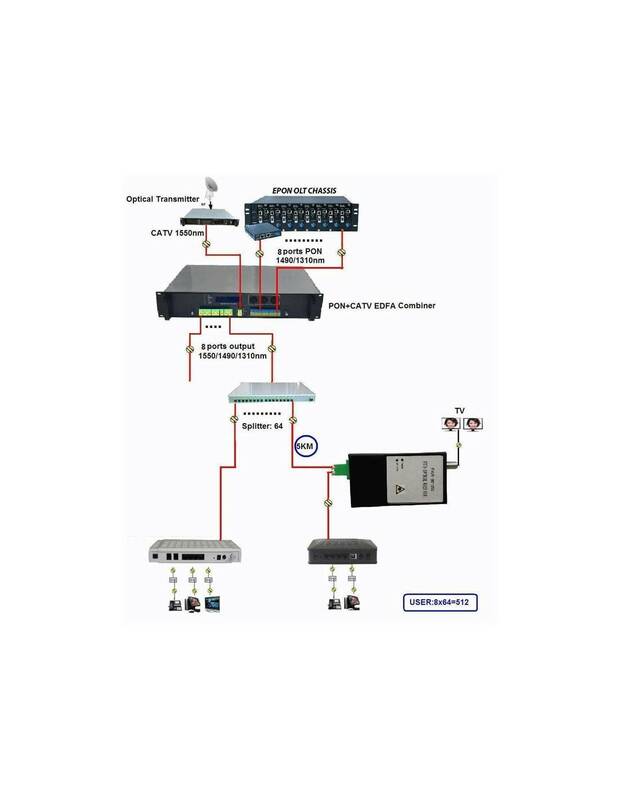 ◆ 8 uplink optical ports used in OLT, 8 ports of PON and 1550nm CATV EDFA Combiner out, Each output port for optical amplifier has built-in well-performed CWDM, and 1550nm CATV’s out-put optical port multiplexes 1310/1490n’s data stream and not lose. ◆ Double cooling system to protect the pump laser. ◆ RJ45 Port for Plug-in SNMP system can realize remote management at any time. ◆ Adopting JDSU, Bookham and Fitel laser. ◆ LCD displays the parameters, functions and trouble alarm. 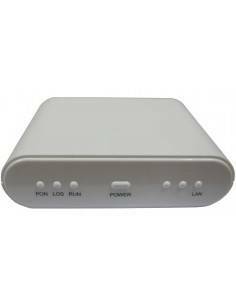 ◆ Switch power supply can work in the range of 90V～265V AC or -48V DC.